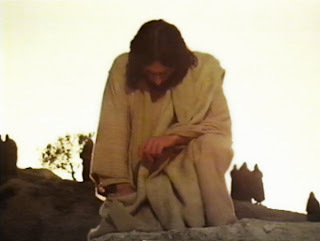 When Jesus was near the city he looked at it and wept over it . . .
From a hill above. Perhaps a natural seat of rock or root. He saw it from up there as it lay nestling in a shell, its houses and domes and blobs of trees talking on that air of innocent humility which even the most dreadful and wicked cities assume from afar. Had you wandered through the streets and along the alleyways the city would have seemed one great sore of arrogance. But from above it looked something else, no longer the sum of its stones, or of the rnisdeeds, rancour and despair of its inhabitants. The city seemed good and amazed as if behind a mirage, within a spell that was soon to dissolve it: it seemed suspended at its last minute between a cry of clemency and a huge envy that would soon fall on it and wipe it out. Anyone contemplating the city from a viewpoint on a hill, as did the Master, would be tempted to stretch out his hand in an impotent caress. But precisely because it felt impregnable, as safe as the stage of a theatre open only to the eyes that look on it, the city had from afar a shrewd recognition of its errors. It washed away the ugly spots of its murders, it camouflaged the corners where huddled its brothels, and when darkness fell its lighted windows vied with each other in telling a story of civilized friendship, as if in every house were gathered round the table a happy family giving thanks to God. And precisely for this reason the city, Jerusalem, which lay only a bee’s flight away, was sad and caused pain: because of that lie it was telling. In that outspread map of houses there wasn’t a single roof that Jesus couldn’t recognize (as we try to do when we climb a church tower). With his eyes he sought the places where for three years he had played out his hard profession as God, the crossways where he had straightened the paralyzed and the crooked, the little side-streets where he had given sight to the blind. Over there lay the pool of Bethesda with its sick people waiting; over there lay the temple from which he had driven with whips the blasphemers who were buying and selling, where the bent woman had been made straight and where the man had regained the use of his shriveled hand. Unpleasant memories. For one friend sent home cured, ten or a hundred enemies had risen against him, had swollen day by day the great revenge. And there it was, only a few dawns away, the revenge that the city would wreak on the Son of man: that barren hill to the east, the mount of Calvary. In scanning the hills with his eyes, Jesus foresaw Titus’s legions gleaming on the plain, the army that was to be the revenge on the revenge: . . . there will come a time when our enemies will entrench themselves around you and besiege you and attack you from all sides, and they will destroy you and your sons and not leave a stone on a stone. But nothing made him more disconsolate than this prophecy of carnage and punishment.